My friends at Dark Sword Miniatures in Minnesota have released some terrific new figures in their range of Ice & Fire miniatures. Here’s Strong Belwas, sculpted by the incomparable Tom Meier and painted by the amazing Jen Haley. And here’s his travelling companion, Arstan Whitebeard, who may be more than he seems. Another Tom Meier sculpt, another Jen Haley paintjob. Welcome to 2013. everyone. Hope you’re all not too hungover this morning. No wild parties for us this year, alas. We sat at home and read. Nothing much on television, but good books never let you down. 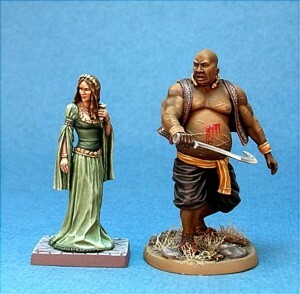 To kick off the new year, here’s a peek at two new figures coming from Dark Sword — Strong Belwas and Margaery Tyrell, sculpted by Tom Meier and painted by Jen Haley. Amazing work, I think you’ll agree. 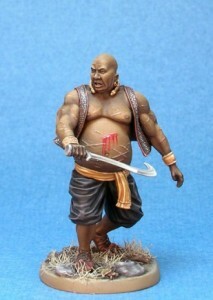 Unpainted versions will be available soon from Dark Sword. Be sure and keep an eye on their website. Lots more cool stuff coming for 2013. Okay, for all your miniature fans, and the others who asked, here are some pix of the miniature me that Santa brought me for Christmas. (No, not in my stocking, he’s much too fragile to go into a stocking). (Turtles are my totem animal. The only pets I was allowed as a kid in the projects). Lil’ GRRM was painted by the amazing Anne Foerster. Hat (with turtle pin!) and glasses were provided by wonderful Raya Golden. And of course my lady Parris was behind the whole thing. Love you all! Merry Christmas!!! 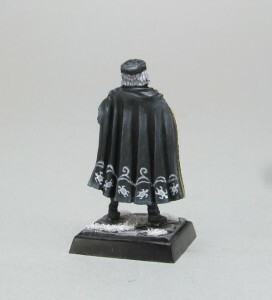 Here’s a great new 54mm release from my friends at Dark Sword Miniatures: a Winterfell set with Jon Snow and Arya Starrk, before time and chance sent them on their separate paths. The sculpts are from the incomparable Tom Meier. Dark Sword Miniatures has posted lovely pictures of some painted versions of their latest crop of Ice & Fire miniatures over to their website. Gorgeous stuff. I thought I’d share them. Here’s Varys the Spider, painted by the amazing Jen Haley. And here’s Bronn, son of no one in particular, again by Jen Haley. And this one is Benjen Stark, First Ranger of the Night’s Watch, painted by Marike Reimer. These figures, and the rest of the range, are all available (unpainted) from the Dark Sword website at http://darkswordminiatures.com Lots more pictures there as well… including the two latest additions to the range, sculpted by the incomparable Tom Meier — King Robert I Baratheon, and Lord Tywin Lannister. Judging by the comments I’m hearing, one of the favorite scenes in this week’s episode of HBO’s GAME OF THRONES was the throne room verbal sparring between Lord Varys and Lord Baelish. 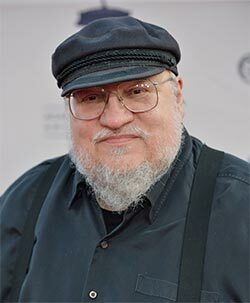 (For which all credit goes to David Benioff and Dan Weiss. The scene was not in the novel. Which is not to say it could not have happened, but neither Petyr nor Varys is a viewpoint character, so I had no pov from which to present such a scene). So for all you miniature collectors out there who would like to recreate such a scene in your own throne room diorama… here are the two latest releases from Dark Sword Miniature. Both sculpts are by the talented Jeff Grace, who just keeps getting better. (And no, they don’t look like the actors in the show. They are not meant to. Dark Sword is licensed to produce miniatures based on the novels, not the television series). 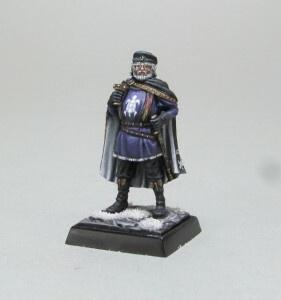 You can order these, and the rest of the amazing Ice & Fire line, from the Dark Sword website at http://darkswordminiatures.com/ There’s a gorgeous painted version of Varys up there as I write, and a painted Littlefinger will not be far behind. Gencon, the big summer gaming convention, has come and gone in Indianapolis. I was not there myself, but Jim from Dark Sword has forwarded me some amazing pictures of Cersei from the painting competitions, and I couldn’t resist the urge to share them. Her Cersei was the queen of the Gencon painting competition this year, winning 1st place in GenCon overall single mini, Dark Sword single mini, Ice & Fire range 1st overall, and Dark Sword Best in Show. All, in my opinion, well deserved. I’ve been looking over tapes of half a dozen actors auditioning for the part of Ser Ilyn Payne in the HBO series. The strangest auditions I’ve ever watched, since all the actors do is stand there and react silently to the lines being read at ’em. No decision on Ser Ilyn yet, BTW. But soon, I think. And… back on the TV series… look for a whole bunch of new casting announcements soon. 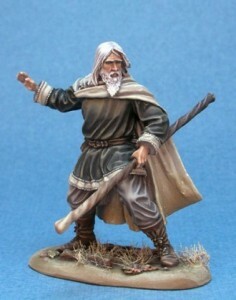 Dark Sword has posted some great painted versions of their latest trio of Ice & Fire pewter miniatures, and I thought I’d share them. Here’s Lord Eddard Stark. (No, he doesn’t look like Sean Bean. We’re not allowed to make him look like Sean Bean. These are based on the books, not the TV show). Sculpt by Tom Meier, painting by Matt Verzani. And here’s young Samwell Tarly, Sam the Slayer his own self, with obsidian dagger in hand. Paint by Matt Verzani, sculpt by Tom Meier. (We’re casting Sam right now for the TV show. Two excellent young actors stand out above the rest. A damned hard choice). Last — but definitely not least — comes Euron Greyjoy, the Crow’s Eye, Lord of Pyke and King of the Iron Islands, with his hellhorn in hand. Sculpt by Jeff Grace, paint by Matt Verzani. All these miniatures, and many more, are available at your favorite gaming store, or direct from Dark Sword via their website: http://darkswordminiatures.com/ Of course, you’ll have to paint ’em yourself. Sorry, Matt Verzani not included.